Half Waif’s Nandi Rose Plunkett live at The Masquerade in Atlanta, Georgia October 12, 2017; photographed by Kevin Brown. “Keep It Out” is a song about the evolution of the self in a relationship: the maintenance of autonomy in the midst of a process of coupling, aging and decay. Director Celina Carney and I developed the idea of showing two states of being that we experience in relationships: together and alone. Together, these entities explore the ways we attempt to escape from ourselves by hiding inside others and what we hide from others by keeping it for ourselves. Fat Tony just released the Snak Pak EP this past week featuring a collaboration with emcee Pregnant Boy plus production by Yung Skrrt and Hevln. Hevln & Tony are originally from Houston, while Pregnant Boy & Yung Skrrt represent the Georgia territories in what could easily be one of the most underrated southern super-groups. “Growth Spurt” brings some classic coming of age kinda shine as Tony & Boy trade verses about their own come up amid an array of Skrrt & Hevln’s hedonistic & hazy production. “Northside Dr.” kicks it sentimental style with Fat Tony’s trademark perfect-prosodic delivery back-to-back with Pregnant Boy’s auto-tuned delivery that offers the feeling of unbound exhilaration as if spring arrived early. L.A. Girlfriend announced the upcoming REGINA EP with the title track video directed by band leader/icon Sydney Banta & cinematographer Colin Trenbeath. Sydney showcases her trademark dance moves, embodying new romantic heroes with Missing Persons-style mascara & an aesthetic that Banta wholly owns that indicates the anthems & arts of a rapidly arriving future. Joseph Black of Donovan Blanc & Honeydrum announced the new album Northern Exposure available February 23 from DIY stalwarts Chill Mega Chill providing a listen to the shimmering brilliance of “What If It’s All Wrong”. From Black’s own honest delivery to the shine emitted from the synths & sax toned inflections; “What If” speaks to our collective constant hive mind of perpetual anxieties that reach beyond the points of measure that are the cause for our second guessing of everything in the world. Freak Heat Waves shared the mesmerizing distortion bouquet that is their title track “Beyond XXXL” from their upcoming upcoming album of the same name available April 6 from Telephone Explosion & Atelier Ciseaux. The Canadian group skillfully shapes & designs their particular brand of distortion to be fashioned into an audio weapon of artistic wonder. Catch them on tour stateside in April in with Preoccupations & May/June in the EU. Canadian dream-weavers Branches Breeze brought us their new single “Resonance” that drifts with resonating chords, keys, hazy vocals & effects that feels like a slow rising to newfound awakenings. The struggles to remember are conflicted with those struggles to forget where memories & feelings flood like an opened realm of consciousness in the mind that elevates both the body & spirit to enlightened realms. Seen recently playing with Francobollo, Girli & the New Year Revolution Festival at King Tuts; Glasgow’s The Vignettes shared an early listen to their new single “Jacqueline” available February 23 from In Black Records. The track trades in the trads of pub pop to a conceptual style of framework that would make the Davies brothers proud; “Jacqueline” is an ode to those local legends from different classes where fleeting shared moments are illustrated in manners of self-conscious narratives. Old Smile, aka Tom Herman continues a streak of proliferation that continues to speak to the imagination of the listener & continues a testament to the limitless power of the solo artist. “Rooftop” illustrates introspective moments of solitary sojourns spent in lofty terraces while “Draining Light” emulates everything from Brian Wilson harmonies with the kind of distorted fuzz guitar one typically associates with dream world ambiance. I wrote “Jungle” during a really weird period of my life, I had just been signed to a record label and was going to New York for intimating meetings, but at the same time I was still living in New Jersey with my parents. I felt like I was being dissolved in the hole between these two bizzaro realities. I had to get out of New Jersey and move on but to do so meant leaping into a life I was so unsure I could handle. Long Island’s Tyler Taormina leads the group Cloud who will follow up last year’s Comfort Songs with the new album Plays With Fire, available March 9 from Audio Antihero, sharing the video for “Wildfire”. Directed by Tyler, with cinematography from Josh Levy & edited by Carson Lund; the chaos of a wild nights are represented through dizzying effects to match the timeless dance vibes at play. Also enjoy Cloud’s meditative track “Mantra One” from last year’s lauded Comfort Songs. Between the dissonance atmospheres, electro oddness & piano notes; Taormina provides a transcendental number to help elevate your week up & away from all the earthbound baggage that holds you down. LA’s own Ashrr presented the ritualistic new single “Medicine Man” that works in ways shamanic ways. From electronic-treated touches to the piano guided mix, Ashrr pens their own style of revelations for the spirit & mind that breaks the places between the mysteries of both heaven & earth. Don’t miss “Jamie”, the latest single from Hurry’s upcoming album Every Little Thought available February 23 from Lame-O Records. The sound of underground eras past & present are recalled in a ballad about the breaking points that separate some of the most sacred & beautiful bonds shared between two parties. London based artist Odina dropped the evocative & sparse new single “Nothing Makes Sense”. Between the slow & gentle strums, Odina paints portraits that allude to the confusion that often consumes our shared weird & wild world. Evante delivered the Vicente Cordero video for “No Names” ft. Mozzy off the album P.U.R.E. available now from Cleopatra Records that steps past the name-checking game for something more lively & real. Evante, Mozzy & company push past the guest list formalities & take their party to an indulgent new level. Fine China returned with the new sweet desert breeze serenity of their new single “Anybody Else” featured off the forthcoming new album Not Thrilled available February 23 through the esteemed imprint Velvet Blue Music. The Arizona group follows up their recent You Are Not The Future 7″ with further evocative audio essences that continues the chronicles of one of the most underrated DIY pop groups in the game. Freja Frances shared the illustrious piano created single “Papercuts” that ponders the prose of letters sent, unsent and the intricacies of feelings behind them that are underscored with subtle baroque strings. The Alex Hughes’ remix of Frances’ “Papercuts” accentuates the track through new ambient & slight electronic applications that elevate the emotive textures to new dimensions of feeling. 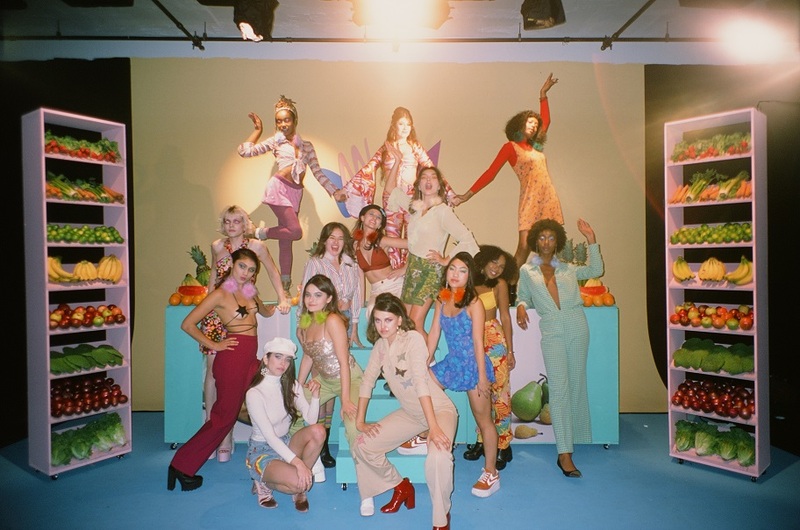 Austin’s Edison Chair shared the Samantha Bennett, Francis Roman & Adriane McCarthy video for “I Hope You Get Everything” that brings to life a series of photograph stills. Watch as crystallized still life is set in motion to the speed of life itself as the Austin band brings a plethora of excitement & upbeat energy to lift up your day or night. Marmalakes provided a listen to the lovely single “New Sweden” featured off the upcoming album Please Don’t Stop available May 11 via Austin Town Hall Records. Pastoral pop & progressions that run like a trickling brook provide introspective avenues & emotions that rise upward toward the sun like the morning dew’s transformation into vapor. We bring you the Julian Pircher video for Hansaa & soso’s “Nights” where duets are expressed in the back & forth discourse of fencing matches & more. Communicative expressions & intimate gestures are experienced in manners that move from the consortium of physical congress to semblances of the supernatural. Queens’ own Jack Killen, oka KILLEN, brought a listen to the epic rocker “Terrible Criminal” featured off Black Sneakers On Concrete courtesy of Axis Mundi. From bold piano lead progressions, KILLEN paints portraits of derelicts aspiring to live a life of crime that discover that they’re just not good at their antihero occupation. Ella Vos presented the emotive & introspective visual for “Mother (Don’t Cry)” from Ania Catherine that plays out like a visceral installation art pop performance. From expressions & choreographed gestures made in a sparse hanger, Ella presents a play of urgent passions in a form of interpretive arts. Denmark three-piece Marshall Cecil presents a listen to their beguiling single “Beautiful World” that works in ways of endlessly unfurling sound-scapes for the senses to soak in. From elements of abstract baroque to ambient electronic elements; Marshall Cecil follows up the Heady (pt. 1) EP with a holistic type of organic audio hedonism. Sleep State provides the peppy single “Awkward” that accentuates the inner emotive experiences that nearly all of us can relate to in one way or another. Drawing up leader Troy Ritchie’s own sentiments from secondary school, everything from embarrassment to anxiety is explored in aspects of honesty told through bright pop tones. QUAL presented a listen to the visceral, non-compromising lead-in track “Black Crown” featured off the new album The Ultimate Climax available February 28 from AVANT! Records. The resurrections from the post-industrial wasteland can be heard like specters materializing from the folderol array of scattered metal & concrete slabs & scraps strewn about as relics from the previous fallen ages. William Maybelline of Lebanon Hanover expounds upon the previous Cupio Dissolvi EP to carve out an artifice of unrelenting catharsis that will shake the core of your being like the bass pluming sub-woofer from your favorite goth-ish nightclub. Introducing 88rising & Red Bull Records’ new signee AUGUST 08 who offered a look at the visual for the new single “Funeral” that breaks beyond the digital blinds for something that is urgent & real. From the chorus reiterations of don’t say it at my funeral, say it to me now, AUGUST 08 trades in a kind of immediacy that seeks to live & love like there is no tomorrow that reckons with the human condition of fallibility while underscoring the constructive future that is now. Air Waves, lead by Nicole Schneit, announced the upcoming album Warrior available April 6 via Western Vinyl & shared the meditative “Morro Bay” that is as mesmerizing as the Pacific coastal town that the song shares its title with. The Brooklyn artist shares a testament to the independence & perseverance of the human spirit in the face of all obstacles, inspired by their family’s struggles & triumphs along with Nicole’s own warrior-like fight for truths & justice in the face of all facets of adversity & injustice. Kidsmoke presented the sentimental new single “Sister Sadness” that musters up all the cadences of melancholy in a bouquet of passions that blossom in ways beyond description. The lowly feelings flow with a hopeful sense that will appeal to the most guarded & sentimental spots in the spirits, mind & ear of the beholder. London’s Earhart presented their debut single “A Cross” available now from Fauna Records that turns up the fuzz to generate their own kind of buzz. Through the dissonance Earhart presents hook after hook that shines with a melodic brilliance through the veil of meticulously designed distortion. Peep the Josh Coll video of hotel dwelling lives for The Wonder Years’ new single “Sister Cities” featured off the forthcoming album of the same name available April 6 via Hopeless Records. Following up No Closer To Heaven, the group shines a light on the emotions & narratives of existences seen in the temporal states of transit. Red Wanting Blue announced their new album The Wanting available April 13 with a listen to the big time sentimentality of “Ulysses”. Echoing a love worthy of being it’s own Homerian odyssey, emotions & hearts run high & wild with a sound certain to lift you up to where eagles & doves alike soar. Mid-80s UK art pop disrupters/provocateurs Tunnelmental continue their trajectories of genre/post-genre & forms deep into the post-post-modern era. Founder Nigel R Mitchell along with Derek Pippert fly their self-styled punktronica flag forward for our weird times with the visual piece for “Eternal Flow” where the constructs, calamities & contemporary conundrums are felt, heard & seen in a series of cataclysms that mirror reality in hyper drive. Israel by Brooklyn artist Kami Maltz presents the single “On the Loose” co-produced by Jake Sherman that casts illuminations on discovering a life of freedom & fulfillment. Amid an ethereal & electronic mix of moods & elated emotions; Kami shares perspectives on the reasons why we run away from adversity that seeks some sort of order & calm in the chaos of our collective existence.